With the rain getting worse, making visibility difficult, we arrived at the town of Tizimin. Nothing tremendously exciting there, basically we just drove through, stopping to confirm directions to Rio Lagartos at a Pemex station. There is a turn-off onto the highway to Rio Lagartos that is supposedly marked, but it is not, so keep your eyes peeled. The highway signs indicate Valladolid to your left and Merida via Buctzotz straight ahead and nothing to the right. This is where you need to turn right. After a fairly uneventful drive along a narrow road with heavy rain and trucks coming from the opposite direction, we arrived at the frankly aesthetically challenged village of Rio Lagartos, where we were immediately spotted by a bicycle-riding tourist-snatcher. This advance person took us (follow me!) to the dock where the arrangements were made to take the bird-watching tour; we paid 700 pesos for the 2 hour tour. The rain had since mostly disappeared except for a light occasional drizzle and when we expressed some trepidation about riding in the boat with the rain, the guide informed us that he had already equipped the tour with some ‘nailoms’. From the english word ‘nylon’ these turned out to be garbage bags… he informed us that we would be comfortable because it was not raining that hard and besides, the nailom we would be using was large enough to adequately protect us from the moisture. When our dubious expressions convinced him that he would have to be a little more convincing, he mentioned that he could get some ‘impermeables’ which are, in fact, raincoats. “Should I get them?” he asked. “Well, yes.” I answered. And dressed in bright yellow rain coats (mine said CFE) we were off. The drizzle was a little too persistent and one of the people in the party insisted on having the top put on the boat. It turns out the top is a canvas material, not particularly waterproof but it did make a little difference. The first stop was a few minutes into the trip, when we were shown a crocodile. Quite a sight! Then the rest of the trip was quite entertaining, if you are into birds; all kinds were spotted along the way. To get to the highlight of the two-hour trip, the flamingoes, you have to go through a very shallow part which seems to take forever and will lull you to sleep if you can get comfortable enough. The motor is turned off, and the guide will pole the boat around trying to get close enough to observe the bright pink birds up close, without disturbing them into taking flight. On the way back, a stop to see where the Salinera de Yucatan makes salt. You can float in the salty water, a rust-red color, filled with extremely salty water treated with some chemicals, and it has amazing buoyancy qualities, if you don’t mind the mystery chemicals that the water contains. This is followed by a beauty treatment, where the guide makes a hole in the mucky sand to extract the fine white clay mud which he proceeds to smear on your face and body, if you so desire. And so, covered in your exfoliating scrub, you head back to the dock, stopping along the way to jump in the water to rinse off. If you are lucky, as we were, the guide will at that point show you a crocodile swimming close by. Back at the dock, we looked for a spot to have lunch but there isn’t much in the way of tourism infrastructure to speak of; in fact, the town is quite ugly and there is garbage everywhere, so we decided to head over to San Felipe, a 10 minute drive away. As you may have read in the neurotic foreigners blog, the Critic had the pleasure of accompanying him on his outing to Rio Lagartos/San Felipe and while it was a great disappointment to learn that one could not sit down in the municipio of Temozon to enjoy a smoked meat taco, the trip was enjoyable enough. The restaurant in San Felipe, El Payaso, was recommended by a friend of that neurotic foreigner as being a good choice for seafood. As he said, what else are you going to eat in San Felipe? Hamburgers? The place was deserted when the Critic’s party entered, with the family sitting at a plastic table near the kitchen. When asked if they were serving food (‘tan abiertos?) they responded affirmatively and got up to start working. Along with the soft drinks, the smallest family member brought over some small platitos with the usual botana (pre-meal snacks) common to the typical Yucatecan beachfront seafood eatery. The Critic only tried what seemed to be cazon entomatado, (shredded shark meat cooked with tomato which gives it a pale red color) since he stubbornly refuses to become enamoured of the idea of the mayonnaise-based options placed before him. The lunch was simple: a seafood soup, breaded filet of fish (empanizado) and fish filet in garlic (al mojo de ajo). The soup was served first and after waiting an eternity, the other dishes made their way to the table as well. The fish was fresh though – the waiter crossed the street and came back with the fish in a clear plastic bag and showed everyone that it was indeed, fresh boquinete. The Critic’s opinion is that El Payaso is really nothing special in the world of Yucatecan seafood offerings – nothing worse or better than what one would find anywhere on the coast. Out of 5, this restaurant gets a 3. A recent outing with visitors to the coastal pueblo of Ria Lagartos via Ek Balam has prompted me to write a comment or three, and will perhaps be of interest to those thinking about venturing out there while vacationing in the Yucatan. First of all, an early start is required, since you are looking at a few hours of driving. We left Merida at 7 AM and arrived, via the toll highway to Cancun and got off at the Valladolid exit, paying the 120 pesos or so for the privelege of avoiding all the small towns – and their topes – along the way. From there, since Valladolid itself was not on this itinerary, we immediately headed towards Tizimin, the capital of Yucatecan cattle country. But first, a stop at the town of Temozón. Brief note to the observant: there are several Temozones in the Yucatan, including Roberto Hernandez’ hacienda called Temozon Sur, on the road to the Puuc region and Temozon Norte, which is a newly or soon to be municipalized (is that even a word?) residential ‘suburb’ of the city of Merida. Since we were a little peckish, we stopped at the taco vendor in front of Temozon’s modest church and had tacos de lomitos de Valladolid, complete with the obligatory pieces of hard boiled egg on top as well as tortas de carnitas. Delicious and cheap. $50 pesos with a tip included. Then, on to the Mayan ruins of Ek Balam, which is well marked on the same Tizimin highway. We were there in about 10 -15 minutes and were able to take advantage of the fact that it was not that hot yet. Still, the sauna-like combination of the rainy season and sunshine was enough to leave everyone sweating profusely. After paying the $27 peso entry fee, which does not particulary have anything to do with the ‘official’ rates posted, you are in. The ruins are partially excavated and there is plenty of vegetation to provide shade. Many facades and details have been restored and the INAH (Instituto Nacional de Antropologia e Historia) have installed plaques with descriptions in English, Spanish and Mayan, of the particular building you are looking at. The climb to the top of the pyramid, one of the largest in the Yucatan in terms of the actual square meters its base occupies, is a long, steep climb but the view from the top is breathtaking, if you have any breath in you after the climb. It is said that on a clear day you can see the Mayan ruins of Chichen and Coba from this vantage point. Halfway up, is a restored entrance which is roped off, in the shape of a jaguar’s mouth complete with giant teeth. This is a detail that is unique to this archealogical site, according to my guide. Besides checking out the cleared and partially restored buildings, it is possible to walk a path around the un-restored ruins, covered with giant trees. This is what I did and was able to find a midden, or what appeared to be one. As you may or may not know, a midden is a site where the ancients dumped their trash and which is a virtual gold mine for archeologists. This particular midden was in remarkably well-preserved condition, so I took a photo which I share with you here. After visiting the site, which took us about an hour, we were once again on the road, heading towards Tizimin and our final destination, Rio Lagartos. Everything was going swimmingly when the sky began to acquire a metallic dark grey color and a few very large raindrops began to spatter on the windshield. This month, yet another Yucatecan restaurant reviewed by the insatiable and ever-critical Casual Restaurant Critic! This is, after all, what you are after, isn’t it? Yucatecan food? 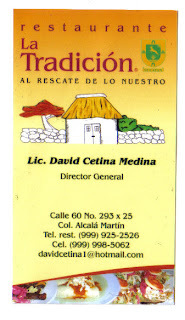 La Tradicion is located between San Fernando and the MegaComercial, on 60 street. It is completely air-conditioned except for some tables on the terrace where you could theoretically smoke those stinky Phillipine-made Marlboro cigarettes you bough in Molas on the way back from Sotuta de Peon. Being as it is July, and the heat is unbearable, the original choice for lunch, Colonos, was discarded and the Critic’s group decided on La Tradicion, which the Critic had heard or read about somewhere. Chef David Cetina was at the door to welcome the party and soon all were seated at two tables – real tables with real chairs, not the cheap plastic ones – and had menus in their hands. After ordering drinks (micheladas, horchatas and jamaicas) a waiter arrived with a small plate of refried black beans with tortilla chips and another with codzitos for snacking while the appetizers arrived. The beans were not only good, they were hot, a real first since at most restaurants they are served luke-warm. The codzitos were crunchy and smothered in what seemed like a home-made tomato sauce. Very good. The appetizers arrived soon after; crispy longaniza de Valladolid and delicious papadzules. In fact, the papadzules were so good that more were ordered almost right away. The temperature was excellent (hot) and the tortillas fresh, the sauce tasty. And the tortillas were thick and hand-made. Nothing like a fresh tortilla, filled with crunchy/chewy longaniza (a kind of thin flavorful chorizo) with some nose-watering, tear inducing chile habanero salsa. Then the main course – panuchos and salbutes were ordered along with the now-obligatory Critic signature dish, queso relleno. At first sight, the Critic was alarmed by the apparent small size of the bowl of queso relleno set before him, but that fear was soon allayed with an abundance of fresh tortillas which seemed to make the dish last for hours. It was delicious. While the Critic’s better half commented that the cheese wasn’t the requisite Gouda (or Edam) the Critic didn’t notice and happily devoured his queso. Afterwards, for the sake of investigation (and to further complicate an impending attack of sever heartburn later) flan and crema española were ordered for dessert. They were creamy and delicious as well. The rest of the menu looked very good as well. At the table next to the Critic’s party, a family was enjoying what looked like a very authentic-looking and generous portion of puchero de tres carnes, a typical Yucatecan platillo which you can’t find that often these days. The bill? $800 pesos without tip. All in all, La Tradicion was a pleasant surprise. The Critic would highly recommend it to both locals and visitors alike. On a score of 1-5, La Tradicion rates a solid 4.5!